I really don’t know where to go with this… way too many things wrong. 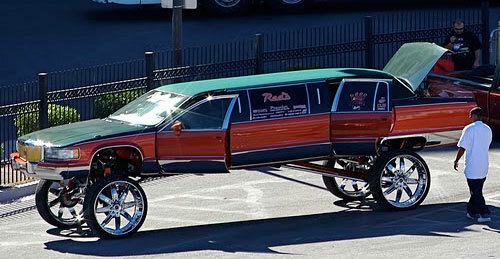 Now I’m all for custom automotive modifications, but this one shows no respect. It looks like one of those monstrosities we used to cobble together with parts from unrelated Revelle model kits when we were bored kids stuck in the basement on a snow day, with Testor’s vapors dancing way too close to the furnace. The only way I’d get into that clownmobile is if I were driving and had complete control over the hydraulics to make it leap and dive through a sea of bumper to bumper traffic while Charlie Estevez-Sheen, Lindsay Lohan, Paris Hilton, and that ex-sports commentator… um… whatsisname Olberman, puked all over themselves in the back seats. This entry was posted on Monday, 28 February 2011 at 12:05 AM and is filed under Automotive, Babe Magnet, Bizarre, Douche Baggage, Humor, Odd, Stupid. You can follow any responses to this entry through the RSS 2.0 feed. You can leave a response, or trackback from your own site. I bet no one steals the tires off of that thing. Imagine how many blocks they would have to have!!! plane– Bet no one volunteers to unload the luggage either. nursem– Painting it lime green and pink would actually an improvement.